I once had a quite lengthy conversation with a traffic engineer—about seven seconds. We were discussing if an intersection should include no-turn-on-red to increase safety for bicycle riders and pedestrians using an adjacent MUP. The engineer’s concern was that this would delay drivers by an average of seven seconds each. This was fascinating, as it seems that I am routinely delayed for much more time than this for no real reason at all—at empty intersections. For the next several days I used a stopwatch to figure out how much time I was needlessly delayed by traffic lights each day. The number: 17 minutes per day on average. I was, I think, somewhat conservative. I would start the watch after I’d come to a stop and there had been no conflicting traffic for at least a few seconds. In other words, when I could have safely proceeded were this a roundabout. The worst was nearly two minutes I sat at one red light without a single other car in sight the entire time. Note: I am not a traffic engineer so am venturing well outside of any area of expertise. The following is based largely on my observations of road and junction designs from a gob of driving in numerous countries. In short, I may be all wet. 32 seconds waiting at this light with zero cross traffic (and the others got there before me). The focus on efficiency is fascinating given that cars are the least efficient mode of transportation that exists. Per person cars require more space, more asphalt, more fuel, and produce more pollution than any other mode. Cars are also likely the most expensive mode. I’d guess that it is perhaps cars inefficiency that creates the need to focus so much on making their use as efficient as possible. That said, I am quite thankful for my inefficient car when it’s 10f below outside. Traffic engineers in the U.S. center much of their world around LOS or Level-Of-Service—how many motor vehicles can they get from point A to point B with as little delay as possible. Generally, anything that reduces LOS is bad. LOS is quite focused. It doesn’t account for noise or how many people are killed by it. Traditionally there seems to have been little or no consideration of LOS for pedestrians, bicycle riders, disabled, or people in nearby shops, houses, or yards. This might partially explain our traffic engineers’ reluctance to do something that might delay traffic a few seconds (along with their contention that drivers in the U.S. don’t obey no-turn-on-red signs very well anyway). This may jive with the average U.S. driver who may well get more frustrated waiting a few seconds to make a right turn on red than waiting much longer to go straight on red through an empty intersection. This is perhaps not dissimilar to drivers seeming to have more angst being delayed 15 seconds by being behind slower bicycle riders than being delayed 50 seconds at the next traffic light. LOS does though appear to sometimes be subservient to efficiency. I say this only because of the seemingly very long cycle times programmed in to our traffic signals. More on this below. And this all seems encapsulated in TTWWADI—That’s The Way We’ve Always Done It. Not in itself bad given that mistakes in trials and experiments can cost lives. However, given how much more dangerous the way we’ve done it is compared to the rest of the developed world perhaps it’s time to toss the way we’ve always done it. Fortunately, the younger generation of traffic engineers (and a few others) seem inclined to do this. We have, seemingly anyway, a gob more stop signs and traffic lights than elsewhere. I’d guess that that for every mile, I encounter five to ten times as many here as in Europe where junctions are dominated instead by roundabouts and sharks teeth (yield). An intersection such as this in downtown White Bear Lake could easily be replaced with a two-lane roundabout and all turn lanes eliminated. In Europe this might very well be a single lane roundabout with hi-way 61 (4 lanes, north-south) reduced to two lanes. Both options would free up right-of-way for bicycle paths, sidewalks, and plantings, make crossings much safer (2 or 4 lanes instead of 7, a single conflict point), and reduce delay for drivers. This would also eliminate the current east-west division of downtown White Bear. Roundabouts are generally more efficient than signalized or stop sign controlled junctions and are considerably safer. They are self-regulating in allowing traffic to go as soon as possible instead of only when some traffic engineer made a guess several years previous. My 17 minute measurement was really a measurement of how much time I likely would have saved had each of my traffic lights been a roundabout instead. Roundabouts have numerous other benefits. The number of driving lanes can often be reduced since roundabouts require less queuing space for cars waiting on a green light. Turn lanes are nearly always eliminated. Roundabouts require no electricity to operate, they continue to function when power is out, have no controllers to become obsolete, and require no effort to program, re-program, and re-program again. They are aesthetically more appealing, especially if they include plantings in the middle and they result in less pollution than cars stopping at signs or lights. My very rough guess is that over half of our traffic light controlled intersections and maybe three-quarters of stop signed intersections could and should be replaced by roundabouts. Roundabouts are extremely dangerous for bicycle riders and every roundabout should have segregated paths for bicycle riders and pedestrians with crossings set about one car length from the roundabout and sharks teeth used to indicate right-of-way. We seem to have really long traffic light cycles (the time it takes to go through green, yellow, and red for all directions). If you miss a green you’ll likely wait a considerable time before that green comes around again even if there is zero conflicting traffic. From a traffic engineers standpoint these longer light cycles are more efficient because each cycle has some inefficiencies built in such as red clearance interval which can ‘waste’ about 2 to 18 seconds per cycle. Very simply, while 80 short cycles per hour might ‘waste’ 800 seconds to clearance time, 40 longer cycles only waste 400 seconds. Efficiency is a funny thing though. Those ‘wasted’ seconds are only wasted if they are actually delaying people. More, they are offset by other issues such as how much people are delayed simply waiting on a cycle to complete when no conflicting cars are present and increased danger of people trying to make a ‘pink’ light to avoid the extra long wait. In The Goal, Eli Goldratt addresses two topics important to us here; that efficiency itself and particularly by itself is not always good and his Theory of Constraints that looks at addressing bottlenecks in a system of bottlenecks. Shorter cycle times may be less efficient mathematically, but in the larger scheme of our real world may be very beneficial in reducing time wasted at empty or near empty junctions and this might reduce our ‘need’ to speed up to make a yellow/pink/red light (which may reduce the need for longer red clearance intervals). How often have you approached a stop sign, could see that there were no other vehicles (motor, bicycle, or Flintstone) anywhere in sight, and wondered why you had to stop? No need to stop if not necessary (Photo van Jan Duffhues) . There are two problems with this very routine scenario; it’s a waste of time and energy, and it encourages law breaking (because rational people usually don’t stop and once you break one law, the next is much easier). Many of these junctions can likely be converted to yield junctions with traffic in one direction being given right-of-way over other directions and importantly, other directions only yielding when necessary, not stopping when unnecessary. Also, a roundabout is simply a high efficiency four-way (or multi-way) yield. If traffic is such that giving a yield to one direction makes it difficult for that direction to get through the traffic that has right-of-way then a roundabout or mini-roundabout is likely a good solution. The result of these changes could be a road system that is safer, less frustrating, and gives us back our 17 minutes. In many of these incidences I would not have had to stop at all were these roundabouts. You need only read discussions of pros and cons of various measures such as for Exclusive Pedestrian Phases to see just how much everything is focused on no harm to motor traffic regardless of anything else. There is a significant difference in the design and operation of a roundabout and that of a traffic circle. These two should not be confused. Red clearance interval is a period of time during which all lights are red to give cars in an intersection time to clear before others are allowed to go. Clearance intervals are primarily used each time there is a change in direction such as from east-west to north-south but may be included for other changes. Great article. Roundabouts make so much sense. One question: are roundabouts more difficult to plow? On a related note, are curb bump-outs challenging for plowing? If so, what have cities done to ameliorate that problem? Roundabouts are quite popular throughout Sweden, Finland, and elsewhere with considerable snow so I’d guess that they’re not too much more difficult if more difficult at all. Not sure about curb bumpouts. Stoplights truly are the enemy of the urban street and the rural road. There was a Hennepin County stoplight for folded diamond ramps near my work that was flashing red for weeks, and EVERYONE was commenting about how much less wait there is, even during peak periods. And I’ve written extensively about how urban stoplights are a waste, so I won’t rehash that. And then I drove US 52 this weekend, where the last stoplights (Canon Falls) had just been removed. And guess what! Much less bunching and “compression waves” on the drive after passing through Cannon Falls. Something I was looking at with shorter cycle times was increased platooning or compression waves. There seems to be considerable debate about this with some saying that while the shorter cycle times might create more opportunity for platoons, it may actually create fewer and those created will involve fewer vehicles. Problem is there’s no money for replacing a lot of the rural stoplights. Pequot Lakes decided that they wanted a bypass instead of a through-town alignment when the MN 371 expressway is extended northwards, but Mn/DOT plans on building a stoplight on the bypass. The county is taking a dim view of that, in part because it would be a barrier between the town and Breezy Point, where they’re trying to connect with a multi-use trail, so they’re agitating for an interchange now. I, too, think roundabouts are preferable to the double left turn lanes, and massive intersections that result. However, I question if (busy, 4-lane) roundabouts can truly support urban-style, sidewalk-facing development. I’m thinking about this in the context of Richfield, where the county installed a roundabout at 66th & Portland. It’s less of a commercial area than other parts of the city, so the lack of redevelopment can’t be really blamed on the roundabout. As the city/county moves toward rebuilding 66th Street, roundabouts have been discussed for the intersections at Nicollet and Portland. None of the four corners of either intersection currently have zero-setback, sidewalk-fronting development, but that is the ideal vision for future redevelopment, particularly at 66th & Penn. While roundabouts are certainly preferable from a traffic-moving standpoint (less so for pedestrians, just look at Portland & 66th), I would need to see several really good examples of truly urban development that fronts a large, busy roundabout. Barring strong evidence that it can be done, Richfield should be pretty wary of putting in roundabouts at Nicollet and/or Penn, if it means that the traditional/urban mixed-use development will never come. Streetfront retail on single and two lane roundabouts is not uncommon in Europe. I’ll try to post some pics. It is usually set back a bit more (5- 10 feet?) than retail along straight streets and doesn’t always follow the curve of the roundabout. In NL it will also have both a bicycle side-path or cycletrack and sidewalk between the traffic lanes and buildings. It seems that there is a strong preference for the bicycle path to be separated by some distance in NL since cycletracks will often become a side-path near the roundabout and then become a cycletrack again afterwards. Why do you say ‘less so for pedestrians’? I’m far from an expert but looking at 66 & Penn images it looks like the righthand radiuses are too wide which allows vehicles to take them at quite high speed. I wonder too if the lane widths approaching the roundabout are too wide (12′ instead of 9.5′ or 10′?) which also increases speeds. 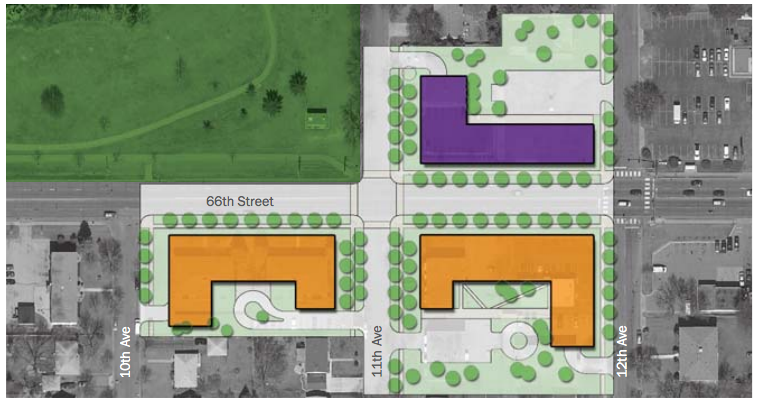 But look at these lovely little colored blocks Richfield put in a dusty PDF, indicating four buildings with beautiful frontage on the Portland roundabout. Of course, there’s also these little colored blocks, one of which now houses a shiny new O’Reilly Auto Parts parking lot. I guess a parking lot is “neighborhood mixed use” of sorts. Anyway, roundabouts. I agree with your concerns, Matt. To my knowledge, Portland/66 is the best example in the metro of a high-volume urban roundabout. And it has not attracted any redevelopment — although arguably the Cedar Point one has. 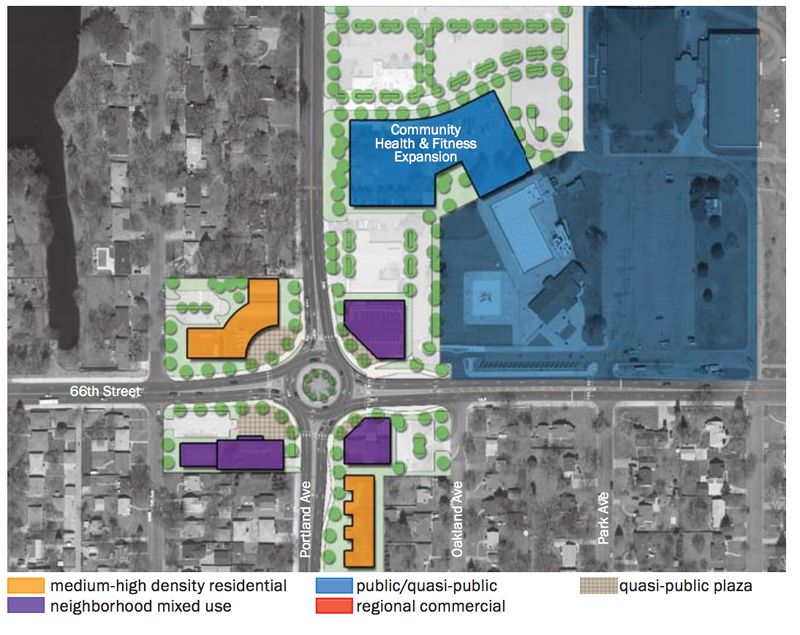 It is being looked at for Lyndale, where two corners to have zero lot line (or just about) development, and a third will soon have a parking lot buffered by zero lot line buildings. Given the high number of senior units around here, I have my hesitations about pedestrian crossing. One situation where I would be quite OK with a roundabout is 66th & Penn. The reason being that staff say that may be able to smooth traffic enough to look more seriously at a 3-lane 66th from Penn to 35W. (No commitment at all from Hennepin County, but some unnamed traffic consultants are doing projections.) If it made the difference between a 4- or 3-lane 66th, I would gladly take a roundabout, even with the tradeoffs. Should also mention flashing yellow arrows are going a long ways to reduce wasted time at intersections. It’s always been a trade-off between the safety of a protected only movement and the efficiency of protected/permissive and permissive only. Flashing yellow arrows are less safe than protected only, but safer than protected/permissive or permissive only using green balls, so in most cases it’s a desirable upgrade from the later, and an acceptable compromise from the former. Monte, Do you have any insight into why we had to wait until the 21st century to get the flashing yellow left turn arrows in MN? Because in terms of traffic flow and reducing congestion/pollution, it seems like the most obvious improvement ever. Was it simply a technological issue? Or were there some state/local policies that had to be re-written to allow it? It just seems like something we should have had a long time ago (and should have a lot more of, especially when signals can be turned to flash yellow at lower volume periods, and use the red/green arrows during peak periods). I think the biggest thing is that not only do you need to upgrade the signal heads, but you also need to upgrade the controllers (ASC2 to an ASC 3) and most cities don’t have that kind of budget for signals. Ideally they would be put at every signal since they’re so versatile though. But just look at Minneapolis. They were updated and finished being retimed this year, and the last update they went through was a retiming in the mid 90’s. The signals themselves are from the 70’s. Now imagine a smaller municipality trying to upgrade. However MnDOT’s policy is to install flashing yellow on every new signal they build and do other updates on. Why are the controllers so expensive? Do they need any more processing power than a first generation iPhone? Is the controller and relay/triac one unit (poor design for cities, good for companies that sell them)? Is there enough savings in LED conversion to cover the cost of a new controller? Sorry about that, I meant that conversion isn’t just the heads, but also the controllers and other hardware that goes with it. So the controllers aren’t necessarily the most expensive part, but when everything gets accounted for, from rewiring, installation, new heads and other hardware, I think that it comes out to around $9,000 per intersection. Granted, that was in Oregon (the only thing I could find about conversion costs — God forbid that brochures would ever show the cost of their products), but I couldn’t find anything in MN. I’m confused by your LED comment. As far as I know (correct me if I’m wrong Monte) most existing heads are LED. Well, a new controller (assuming you don’t need an entirely new cabinet or other goodies to go with it) is about $1500-$2000. An LED is about 10-15 watts as opposed to 116-150 for an incandescent bulb, so I’ll let someone else do the math. You’d have to figure that there’s costs with sending a truck out to update the controller and the signal heads (there’s an experiment that the FHWA approved that I don’t like to use a standard three section head to save on new hardware and wiring costs), and reprogramming it, which could be time consuming if it’s coordinated with other intersections. And most signals are LED already. As to why they cost so much, there’s liability with something like that, and your market is new and replacement traffic signals, not everyone with a phone, so there’s fewer companies (The three big ones are Econolite, Eagle/Siemens, and Intellight) making them, R&D costs spread of fewer units, less price sensitivity for government buyers. Things move as slow as molasses in the traffic signal world. As to why someone didn’t come up with the idea in 1970 or 1980 or whenever, I don’t know, but once someone comes up with a neat idea, they have to submit a proposal to the FHWA, They then review it and say yes or not, if they approve than it can get installed on a experimental basis, then it’s studied and the FHWA says yes or no on whether it can become standard practice. If so, then there’s time for all the manufacturers to write new firmware, agencies to get money for upgrades, which in the case of the FYA usually requires at least new firmware and in some cases entire new cabinets, and they don’t have the resources to upgrade everything at once. The FYA experiment started in 2001 and was formally approved for nationwide use with the 2009 MUTCD. Minnesota first used them as part of the experiment in 2008 at Dodd Road and MN 110. My spotters guides to traffic signals are an indication how much ancient hardware there is out there, there’s still a lot of incandescent indications on heads that date to the 1940s. Some agencies are still not putting up flashing yellow arrows in new installations, say Minneapolis, whereas Woodbury and Washington County have a plan to retrofit virtually all of the signals in Woodbury in the next year or two. Most agencies have a compromise where they’ll install them on all new installations, or retrofit them if it’s easy to do, say a newer controller where only a new firmware update is required. There were some older ideas, notably Michigan had a flashing red ball over left turns, which in theory requires cars to stop but in practice was treated the same as a flashing yellow arrow, and Seattle and Reno had flashing yellow balls. Probably the impetus for the change now is that with new software it’s been figured out that the most efficient way to move traffic in a coordinated system is lead/lag protected/permissive. If you do that without flashing yellow arrows you get an incredibly dangerous situation called the “yellow trap”, where both drivers expect the other to stop. 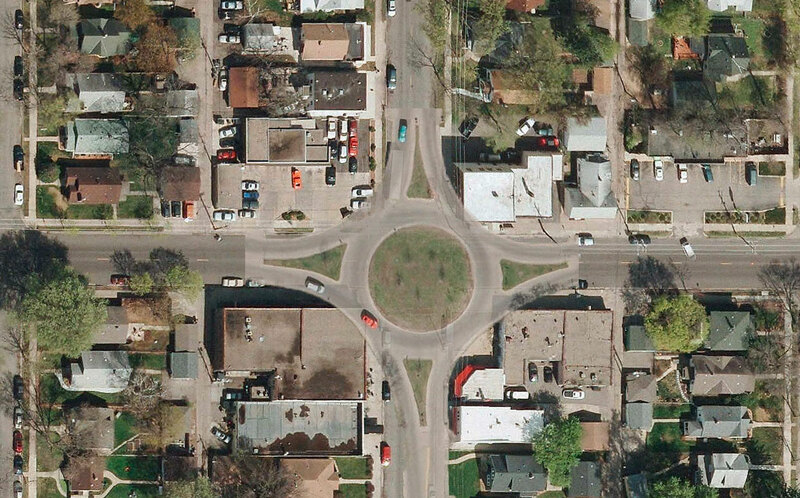 For lower volume streets, just look how well the Minnehaha Park roundabout works. A roundabout like that could replace 3/4 of the traffic lights and 4 way stops in Minneapolis with improvements for everyone’s safety. That’s true, but the tradeoff is size. Although compared to large suburban-style intersections (say, France Ave and 76th St, or Hiawatha and 28th) a roundabout occupies less space in the approaches, it definitely occupies more space in all regards for smaller intersections. Here’s a quick overlay of the Minnehaha roundabout at 42nd St and 28th Ave — not even including the sidewalks, it would hit three buildings. It could probably be shifted north to just take out one building and one parking lot, but even that’s a pretty tough sell if the neighborhood is satisfied with the existing conditions. Mini-roundabouts and neighborhood traffic circles are also options, but they lack the inherently safe geometry of a roundabout (that is, that traffic is forced to enter at such an angle that head-on and T-bone crashes are impossible). Great image. Do you know what the traffic volumes and speed are? That looks like a high-speed roundabout given the radiuses. Not sure what the posted speed for is within the roundabout, but it’s at three park roads and a city street — so 25 mph at three legs, and 30 mph at the fourth. The center island is 80-90′ which is about the same as (a little smaller than) the two Richfield roundabouts. Not sure about the roundabout itself, but Minnehaha Ave (from the north) carries 7800 ADT at that point, and Minnehaha Pkwy carries 12,700 just west of the Hiawatha overpass (although there’s probably some drop-off before that). 28th Ave & 42nd St is slightly less — 5600 / 8000 ADT — but similar ballpark. The roundabout you overlay’d does seem large, not so much the inner radius (though it may be as well), but mostly the outer radius and the right turning radiuses seem huge. It’s somewhat unusual for the right turn radius to be continual as they usually fillet in to the left radius of the roundabout and then proceed right again after a bit. Many roundabouts in the UK and EU have a 12 meter inner ring (30′ ?) plus a 3 meter truck track, though I’m not sure about the traffic speeds/volumes on these. As you said your overlay doesn’t include sidewalks nor does it include a very critical cycle path (bicyclists should NEVER have to navigate through a roundabout unless it is a junction of only low speed bicycle roads). You mention this in your article, too, but I’m not clear why you think bicyclists riding through the roundabout is critically unsafe, but crossing on a sidewalk or a bike path is acceptable. The main safety features of a roundabout are its lowered speed and the angle of entrance/exit. At the location of a crosswalk (set back at least one car length from the circle), traffic is going slightly faster and the angles are less favorable — basically “T-boning” bikes. In any case, a shared cyclepath or MUP seems like it would be quite dangerous in a commercial corner like 28th/42nd. A driver approaching a roundabout will look quickly for a car coming from their left and if they don’t see one then they’ll proceed. The problem being that they’re not looking for cars & bicycle riders. Slower speeds help reduce the severity of these collisions but apparently not the overall number. Secondarily, drivers will often believe that they can pass a bicycle rider in a roundabout just as they do on the street. A bike path crossing a road at a roundabout has some critical factors in it’s favor. There is a clear marking indicating that bicycles and pedestrians may be present, the interaction is at a 90 degree angle so the driver can, interestingly, see the bicycle rider easier than in the middle of a roundabout (perhaps because of the markings they are specifically looking for them), and the bicycle rider has a bit more control over placing themselves in danger. Also, at least in Europe, the crossings are very clearly marked with sharks teeth. It’s very clear who has ROW and who is supposed to yield. If the bicycle rider has the teeth then they’ll have to wait until no cars are present so that they can cross safely. If the driver has them then they know that they must check for bicycle riders prior to proceeding. Sharks teeth seem to be very effective in getting people to yield properly. While driving in the northern UK this summer, I was really impressed by the roundabouts. I wonder if things like roundabouts help create better drivers because they have to pay attention to what everyone around them is doing. One other thing I liked driving there was the combined red and yellow signal right before the light changes to green–helps everyone get ready to go. You can see that this technology allows cars to move through intersections without stopping and accomplishes the same thing as roundabouts, a quaint 19th century solution, that creates new problems as you’ve pointed out. I’ve read some of your old comments and stuff, because I’m very interested in what you’re doing. However the same question pops up for me. Does it work at actuated signals? In some of your previous comments you said you have it tap into the guaranteed green of the signal. Are you referring to the minimum green time? Because this is only about 15 seconds per phase at times. Or does it also communicate when the extension has been activated (ie when it adds 2-3 seconds to the phase) as well? Would that make the speed needed to travel change at different parts of the phase? I’m really intrigued by your roundabout comments. What problems do you see with them? How would your solution be better? It would seem to me that your solution would be good for junctions that require traffic signals but I can’t see how it would ever be better than a roundabout. Here’s a post I did right months ago making a similar argument. Yes! I even referenced it in a couple of previous articles and had a note to do so this time. I have a question for Walker and readers: What would be the average trip delay at an average 100 second total cycle traffic light be? Include in your estimate all traffic, include dedicated left turn timing, and include an average queue length? Ballpark it. Driving North on Hiawatha in light traffic the average was 34 seconds. I stopped at 7 out of 9 lights. Is that average? What ould be the national average trip delay at an average stoplight? I can’t find any figures. For a motor vehicle, pedestrian, disabled, or bicycle rider? I’m confused on how you think it would be safer for pedestrians… I get the lower cost, as well as the (possible) efficiency difference (Even then, does the system account for left turns, e.g. go 20 mph if you’re turning left, 30 if through, or does it only work on 2/4 phase signals? ), but the safety aspect seems iffey. Roundabouts are the safest both for pedestrians and drivers. For drivers it eliminates the head-on and right-angle crash while reducing less dangerous types, and for pedestrians it minimizes the gap that needs to be crossed, if built correctly (one lane opposing, refuge,one lane opposing vs making a mad dash across two lanes of opposing). Now toss in the aspect of people paying more attention to their speed than their surroundings. Would it be less safe for pedestrians as vehicles at the end of the platoon try to squeeze in to make the light? Would issues with pedestrian walks and end of platoons arise? Would rear end crashes rise with differentials in speeds/stragglers trying to make the light? It would be interesting to see the compliance to the recommended speed. You can simulate something to make it look like almost anything you want it to, but it doesn’t mean anything if it doesn’t transfer into real life. Does the human aspect change how it will function? I know it looks like I’m trying to shoot you down, but I assure you I’m not. I think this is a great idea (wish I would have thought of it! ), but some burning questions always seem to pop up when I get into thinking about it.